The Mushki were an Iron Age people of Anatolia who appear in sources from Assyria but not from the Hittites. Several authors have connected them with the Moschoi (Μόσχοι) of Greek sources and the Georgian tribe of the Meskhi. Josephus Flavius identified the Moschoi with the Biblical Meshech. Two different groups are called Muški in Assyrian sources (Diakonoff 1984:115), one from the 12th to the 9th centuries near the confluence of the Arsanias and the Euphrates ("Eastern Mushki") and the other from the 8th to the 7th centuries in Cappadocia and Cilicia ("Western Mushki"). Earlier Assyrian sources clearly identify the Western Mushki with the Phrygians, but later Greek sources then distinguish between the Phrygians and the Moschoi. Identification of the Eastern with the Western Mushki is uncertain, but it is of course possible to assume a migration of at least some of the Eastern Mushki to Cilicia in the 10th to the 8th centuries BC, and that possibility has been repeatedly suggested, variously identifying the Mushki as speakers of a Georgian, Armenian, Anatolian or Phrygian language. The Armenians according to Diakonoff, are then a later amalgam of the Hurrian (and Urartians), Luvians and the Proto-Armenian Mushki who carried their Indo-European language eastwards across Anatolia, although historically, Armenians only appear in the mid 6th century BC in the southern Caucasus and northeastern Anatolia. "Modern studies show that assertions about the proximity of Greek and Phrygian (mushks) with Armenian are not confirmed in the language material. The Eastern Muski appear to have moved into Hatti in the 12th century BC, completing the downfall of the collapsing Hittite state (already largely annexed by Assyria), along with various Sea Peoples. They established themselves in a post-Hittite kingdom in Cappadocia. Whether they moved into the core Hittite areas from the east or west has been a matter of some discussion by historians. Some speculate that they may have originally occupied a territory in the area of Urartu; alternatively, ancient accounts suggest that they first arrived from a homeland in the west (as part of the Phrygian migration), from the region of Troy, or even from as far as Macedonia, as the Bryges. Together with the Hurrians and Kaskas, they attempted to invade the Middle Assyrian Empire's Anatolian provinces of Alzi and Puruhuzzi in about 1160 BC, but they were pushed back and subjugated by Ashur-Dan I. In 1115 BC, the Assyrian king Tiglath-Pileser I conquered as far as Milid. In the 8th century BC, Tabal became the most influential of the Neo-Hittite polities, and the Mushki under Mita entered an anti-Assyrian alliance with Tabal and Carchemish. The alliance was soon defeated by Sargon of Assyria, who captured Carchemish and drove back Mita to his own province. Ambaris of Tabal was diplomatically married to an Assyrian princess, and received the province of Hilakku under Assyrian dominion, but in 713 BC, Ambaris was deposed and Tabal became a fully fledged Assyrian province. In 709 BC, the Mushki re-emerged as allies of Assyria, Sargon naming Mita as his friend. It appears that Mita had captured and handed over to the Assyrians emissaries of Urikki, king of Que, who were sent to negotiate an anti-Assyrian contract with Urartu, as they passed through his territory. According to Assyrian military intelligence reports to Sargon recorded on clay tablets found in the Royal Archives of Nineveh by Sir Henry Layard, the Cimmerians invaded Urartu from Mannai in 714 BC. From there they turned west along the coast of the Black Sea as far as Sinope, and then headed south towards Tabal, in 705 BC campaigning against an Assyrian army in central Anatolia, resulting in the death of Sargon II, although they were cleared from Assyrian ruled territory. Macqueen (1986:157) and others have speculated that the Mushki under Mita may have participated in the Assyrian campaign and were forced to flee to western Anatolia, disappearing from Assyrian accounts, but entering the periphery of Greek historiography as king Midas of Phrygia. Rusas II of Urartu in the 7th century BC fought the Mushki-ni to his west, before he entered an alliance with them against Assyria. Hecataeus of Miletus (c. 550 - 476 BCE) speaks of the Moschi as "Colchians" (perhaps, Georgian speaking), situated next to the Matieni (Hurrians). According to Herodotus, the equipment of the Moschoi was similar to that of the Tibareni, Macrones, Mossynoeci and Mardae, with wooden caps upon their heads, and shields and small spears, on which long points were set. All these tribes formed the 19th satrapy of the Achaemenid empire, extending along the southeast of the Euxine, or the Black Sea, and bounded on the south by the lofty chain of the Armenian mountains. Strabo locates the Moschoi in two places. The first location is somewhere in modern Abkhazia (Georgia) on the eastern shore of the Black Sea, in agreement with Stephan of Byzantium quoting Hellanicus. The second location Moschice (Moschikê) – in which was a temple of Leucothea, once famous for its wealth, but plundered by Pharnaces and Mithridates – was divided between the Colchians, Armenians, and Iberians (cf. Mela, III. 5.4; Pliny VI.4.). These latter Moschoi were obviously the Georgian Meskhi or Mesx’i (where Greek χ, chi, is Georgian ხ, x). Procopius calls them Meschoi and says that they were subject to the Iberians (i.e., Georgians), and had embraced Christianity, the religion of their masters. According to Professor James R. Russell of Harvard University, the Georgian designation for Armenians Somekhi, preserves the old name of the Mushki. Pliny in the 1st century AD mentions the Moscheni in southern Armenia ("Armenia" at the time stretching south and west to the Mediterranean, bordering on Cappadocia). In Byzantine historiography, Moschoi was a name equivalent to or considered as the ancestors of "Cappadocians" (Eusebius) with their capital at Mazaca (later Caesarea Mazaca, modern Kayseri). 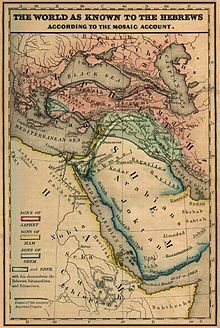 "The World as known to the Hebrews", a map from the Historical Textbook and Atlas of Biblical Geography by Coleman (1854) locates the Mesech together with Gog and Magog in the southern Caucasus. Josephus Flavius identified the Cappadocian Moschoi with the Biblical Japhetic tribe descended from Meshech in his writings on the Genealogy of the Nations in Genesis 10, while Hippolytus of Rome connected Meshech with Illyrians. Meshech is named with Tubal as a principality of the prince of Gog and Magog in Ezekiel 38:2 and 39:1. The ancient city of Mtskheta, near Tbilisi, is believed by Georgian experts to be the former capital of the Mushki state. According to the medieval Georgian Chronicles, the city was built by the legendary patriarch Mtskhetos, one of five sons of Kartlos, the legendary patriarch of the Georgian nation (who was in turn said to be a son of Torgom, the Georgian spelling of Biblical Togar Mah, son of Gomer, son of Japheth, son of Noah). According to the Chronicles, during Mtskhetos' lifetime the descendants of Torgom (including Georgians, Armenians and other Caucasian nations) were united and successfully resisted the attacks of the "Nimrodians", which Georgian experts interpret as a reference to ancient conflict between the Mushki and Assyria. Excavations in Mtskheta have confirmed the town dates back at least as far as 1000 BC. The Chronicles, the older Conversion of Kartli, and the older still Armenian chronicles of Moses of Chorene all give conflicting accounts of Mtskheta's history prior to and during the conquests of Alexander the Great. According to the Conversion, Mtskheta remained the chief city of "Kartli", the medieval native name for Georgia, up until Alexander's arrival, who changed the ruling dynasty in Mtskheta by installing Azo, said to be a prince from Arian Kartli. According to the Chronicles, after Mtskhetos' death, Kartli broke up into several smaller, warring regions, until unity was restored by Azo, said to be one of Alexander's Macedonian generals, who was in turn expelled by the (half-Persian) local prince Parnawaz, and it was Parnawaz who founded the new ruling dynasty of Kartli. Moses of Chorene says that Alexander installed a Persian satrap named Mithridates in Mtskheta. While Georgian experts disagree over the details of their interpretations of these accounts, they generally agree that they reflect a decline of the Mushki state and rise of Persian influence before the arrival of Alexander, who, perhaps more as a side-effect than by any effort on his part, ushered in a new era of unity in much of the Mushki state's former territories under a new dynasty, who preferred the name Kartli over Mushki. Mtskheta remained the capital of the Kartli state, which became known in most languages as Iberia, until the 5th century AD. People in what is now a south-central Georgian region continued to favor a variant of the old Mushki name, and today call themselves Meskhs and their region Meskheti. They speak a dialect of Georgian called Meskhuri, which among Georgia's regional dialects is relatively close to official Georgian. The town of Mtskheta is not in today's Meskheti region, but lies about 100 km to its northeast, in the Kartli region. ^ "Armenians" in Encyclopedia of Indo-European Culture, edited by J. P. Mallory and Douglas Q. Adams, published in 1997 by Fitzroy Dearborn. ^ Vavroušek P. (2010). "Frýžština". Jazyky starého Orientu. Praha: Univerzita Karlova v Praze. p. 129. ISBN 978-80-7308-312-0. ^ J. P. Mallory, Douglas Q. Adams. (1997). Encyclopedia of Indo-European culture. London: Fitzroy Dearborn Publishers. p. 419. ISBN 9781884964985. ^ Brixhe C. (2008). "Phrygian". The Ancient Languages of Asia Minor. New York: Cambridge University Press. p. 72. ^ Cozzoli, Umberto (1968). I Cimmeri. Rome Italy: Arti Grafiche Citta di Castello (Roma). ^ Salvini, Mirjo (1984). Tra lo Zagros e l'Urmia: richerche storiche ed archeologiche nell'Azerbaigian iraniano. Rome Italy: Ed. Dell'Ateneo (Roma). ^ Fragmenta historicorum graecorum I, fragm. 228. J.G. Macqueen, The Hittites and their contemporaries in Asia Minor (1986), ISBN 0-500-02108-2. I. M. Diakonoff, The Pre-History of the Armenian People (revised, trans. Lori Jennings), Caravan Books, New York (1984), ISBN 0-88206-039-2, pp. 115–119. Anne-Maria Wittker, Mušker und Phryger. Ein Beitrag zur Geschichte Anatoliens vom 12. bis zum 7. Jh. v. Chr., Wiesbaden (2004), ISBN 3-89500-385-9. This article incorporates text from the Dictionary of Greek and Roman Geography (1854), a publication now in the public domain. This page was last edited on 29 March 2019, at 19:10 (UTC).